When I bought my house, the front yard was a barely tamed jungle and the backyard got nicknamed (aptly) The Mud Pit. Jaylene was recommended by both the designers (Seed Garden Designs) and a friend, and she was a goddess-send! Hard working, honest, generous, funny, imaginative, kind, and SO talented. She took on my ghastly drainage problem (remember the Mud Pit? There was a matching Mud Crawlspace), fixed it beyond the functional, even the practical, going far past into the beautiful and extraordinary. A meandering dry stream bed, rock hollows filled with water, rushes, elegant red twig dogwoods, swales and berms mounded naturally, elegantly shaped tiny flagstone patio. And there were so many extra touches: waking up one morning to a lovely little brick border, or a tiny rock spill along a border, finding one afternoon a beautiful cement and stone paver under a newly installed outdoor faucet, coming home after a horrible day to a clever gravel bump in my driveway directing away the streams of street wastewater. Jaylene and her crew are always hardworking, cheerful, skilled, and self-sufficient. She shows up exactly when she says she will, does way more than she contracts to do in the best of ways, skillfully takes into account the inevitable problems and always knows when to solve them by herself and when to check in with the designer. I learned to trust Jaylene implicitly after she came, at night, on a freezing and rainy winter day, BEFORE we'd even settled on any real landscape work, to amend a new home owner's disasterous drains because, as Jaylene put it in typical fashion, "Well, I'm worried about the storm that's coming in this weekend. I don't want you to have any problems. We'll fix this now and do the rest later." She did fix it. Perfectly, economically, and it was the true introduction to Jaylene's skill, work ethic, and kindness. I adore her, unreservedly, and cannot recommend her strongly enough! Jaylene is a joy and a wonder. "The garden looks the way I imagined and wanted. I bought some yard furniture with the last of my budget. Thanks for all your hard work. I'll be happy to recommend you to anyone. I'll give a glowing report on Angie's List, too. It's been a pleasure to work with you." 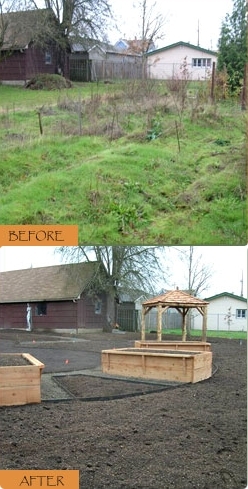 "Jaylene helped me attain the garden of my dreams. She created paths from the front of my house to the back, leading beyond the choisya to my hot tub. She brought me plants I'd never heard of, chocolate akebia draping over one fence with another white bloomer on another fence. Clematis ran up the side of my garden. A forever blooming daphne graced my front garden and little fairy ferns created a little side garden heaven for me. And I didn't have to deal with watering because Jaylene installed drip irrigation for me! Jaylene was a joy to work with." "Thank you so much for the great work you did on our new garden. I admire the care with which you all work, and the wonderful energy you all seem to have in abundance! Best!" "Thanks so much for the great work! I can't wait to plant those pots and sit back and sip some ice tea rather than fight that hose!"